We offer excellent quality of Marble Ganga Mata Statue which is crafted from top notch quality marbles to ensure that the statues last long. The ecstatic workmanship reflects the creativity of our craftsmen and their quest for achieving artistic perfection. Understanding the differences in client demands, we undertake tailor made solutions to craft the statues as per client needs. We are engaged in offering a splendid range of Marble Ganga Mata Statue. 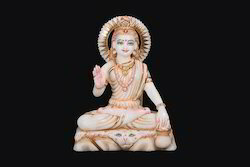 Offered statue has attained immense market appreciation for its intricate designs that gain the attention of viewers. This statue is exquisitely designed by our creative professionals with the use of hi-end tools and latest modeling techniques. In order to meet maximum clients' satisfaction, this statue is well polished that ensure its long lasting shine. Looking for Marble Ganga Mata Statue ?